where most of the creative work takes place. Utilizing Corel Draw and Adobe Photoshop allows any desin project to grow from concept to reality. 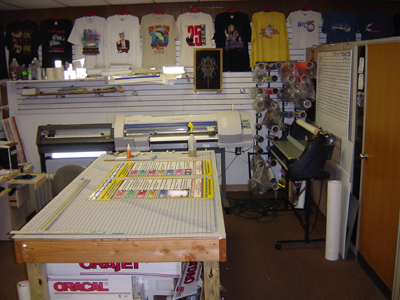 Vinyl production is done on either the Roland SP 300 digital printer or cut on the Camm-1 CX300. 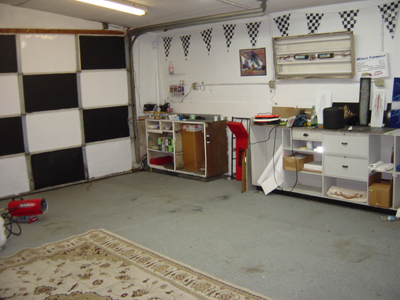 A clean and well lit 1 1/2 car garage is our installation area for vehicle as well as all pinstriping and painted signs and banners. We also have access to a full size garage bay with 12' doors handle any oversize vehicle jobs with ease. - Vinyl Output: Roland CX 300 30" vinyl plotter. Roland SP 300V digital printer/cutter. -Paint: One Shot Lettering Emamels, Excaliber, Kustom Shop & Mack pinstriping brushes.